This post had a different beginning. Before the world was turned upside down by tragic events. Before we woke up, one day, a bit more scared and a lot less free. When a friday night like many others, the weather being nice enough to sit outside in cafés and restaurants or pleasant enough to drag you out of your cozy safe place and take you to mingle with other people like you, wanting to enjoy a concert or a soccer game, transformed into a nightmare or into the last day of your life. Being from Rome, I’ve always considered Paris a sister city, we have so much in common, history, culture, traditions. Of course, like every sisterhood, also a fair share of jealousies: whose food is tastier, whose wine is better, “who is the fairest in the land”. But in the end we got along pretty well and loved and respected each other. I’ve been there many times, studied French Language and Literature, always felt an indescribable connection. I cannot hide that what happened deeply touched me and shook my whole being, even if at the moment I was miles and miles away from it. You feel it stronger if you’re in the same continent, just a few kilometres apart, when you’re part of the same Union, when what happened there could have happened to you in your neighbouring City. And a couple days after the Night of Terror, discovering that the “mind” of the attack came from Brussels, lived there, recruited some terrorists there, in another “cousin” city, one that you like and visited, and considered a safe, cosmopolitan, liberal place, and that you had a post scheduled where you talked about that city and how much you enjoyed going there….well, that news grabbed you by the shoulders and shook you a bit more. I want a world where there are no barriers, no walls, no prejudices, where we can live, love and laugh together, with our peculiar accents, our beautiful shades of skin color, sharing stories and food from our own backgrounds, respecting each other, learning from one another, growing from our diversities. I pray for that world of peace, kindness and unity to come. Because after all, I still believe in us human beings. I’ve been to Brussels many times. It is a lovely city and the capital of Belgium, in northwestern Europe, and it is also the Headquarters of the European Union. I’ve been working for a Ministry in Rome for 24 years and -what seems like a lifetime ago- I was a member of a European Committee that met once a month in Brussels. That gave me the opportunity to know the city inside and out, plus some beautiful surrounding areas. Moreover, my dear friend Silvia and her husband moved there to work where they stayed for quite some time. During those years, I often went to visit (sometimes alone, sometimes with a couple other dear friends) and enjoyed myself immensely (I also did extensive shopping and I still own some great fashion pieces that I bought there). I don’t remember ever eating or ordering at a restaurant (or Brasserie) Brussels Sprouts; I imagine they may have originated and gained its name there, but they are not the food I associate Brussels with. Moules-frites (mussels and fries), Endive au Gratin (gratin endive), Croque Monsieur and Croque Madame (kinda sandwiches), Gaufres (waffles), tons of Chocolate and gallons of Beer, that is what comes to my mind. Such pleasurable memories! I guess these Brussels sprouts are way healthier than all the yummy food I listed above. And sometimes healthy and tasty can go hand in hand. This is the case and much to my surprise, since I did not consider myself a Brussels sprouts’s connoisseur. Note that I said “didn’t”. That means that I may have changed my mind. The credit goes mainly to the quality of the ingredients: organic local Brussels sprouts bought during our saturday visit to the Strathcona Farmers Market, a cold pressed extra virgin olive oil and a fantastic balsamic cream (Crema di Aceto Balsamico) that we brought back from Eataly, Rome. Salt, pepper, garlic and chopped hazelnuts just enhance the overall delicious flavor. The caramelizaton that occurs while they are roasting in the oven is amazing. And the smell they spread in the house is delightful. The chopped hazelnuts give a nice crunch and some sweetness that blend perfectly with the earthy flavor of the Brussels sprouts and the tangy yet sweet creaminess of the balsamic cream. They were a revelation, at least for me, I would have never imagined to go for seconds. Tender, candied, crunchy. Enjoy your intake of vitamins, fibres and minerals. Today’s song can only be John Lennon’s “Imagine”, in the touching rendition of a soloist, performing it on the piano the day after the events outside the Bataclan. 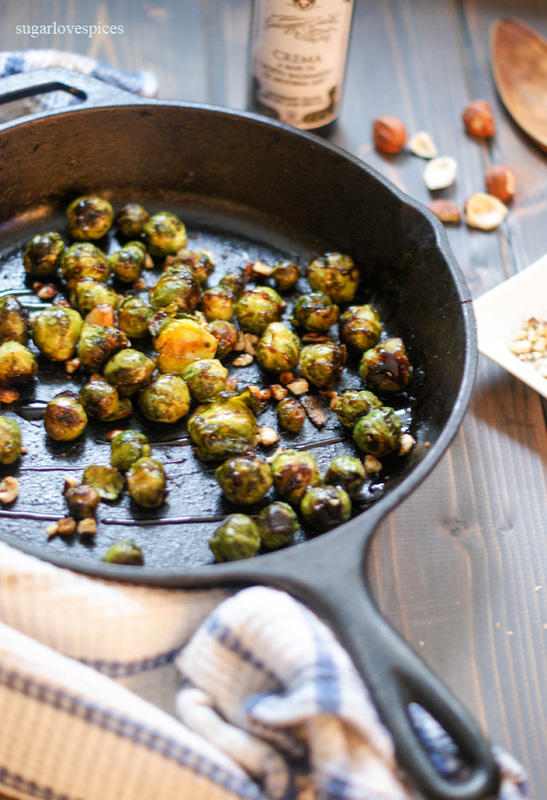 Place Brussels sprouts in a cast iron pan with the garlic whole. Toss with extra virgin olive oil so that the sprouts are well coated. Sprinkle generously with salt and black pepper. 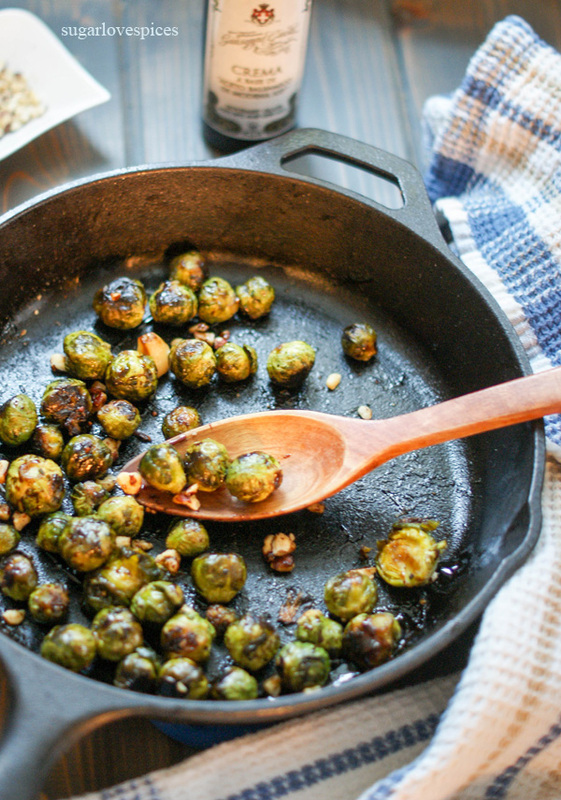 Put Brussels sprouts in the oven and cook for about 18-20 minutes, stirring occasionally so that the sprouts get coated with the oil in the pan and evenly cooked. Return baking sheet to oven and bake for about 10 more minutes, or until sprouts are as browned and caramelized as desired. Your brussels sprouts look so delicious, I love all those caramelized bits 🙂 Yum! Thanks Heidi, together we can create a world of peace! As for the brussels sprouts, the caramelized bits are my favorite part 🙂 . My heart goes out to you, your friends and family, and everyone effected by the events that took place in Paris. I hope that some goodness comes out of that horrible evening. Even now there seems to be unity between countries where there was none before. 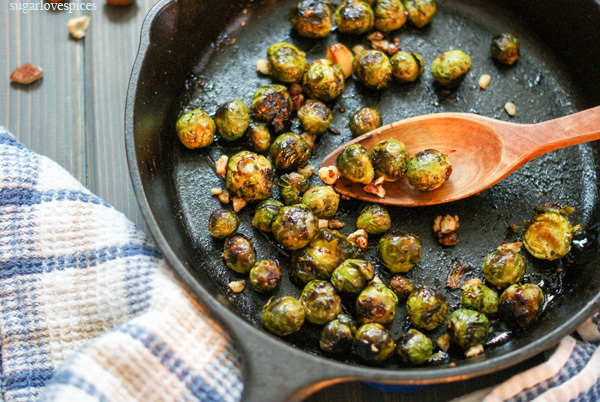 As for the dish, I absolutely love brussels sprouts and look forward to trying this variation. Thanks Diana. Unity is a great thing. Unity in our own diversities and respect for one another makes the world a better place. Anyway, the brussels sprouts were awesome with that sweet and crunch. The events were tragic. What’s worse is that when we succumb to the terror, they win. I think that the best way to overcome these despicable people is to live, eat, and cook – celebrating what they hate the most. Your Brussels sprouts look lovely. I love the crispy look they get after caramelized in the cast iron pan. I probably hated them as a child, but I’d eat them with gusto now! Wise words: Live, love, cook and eat 🙂 . 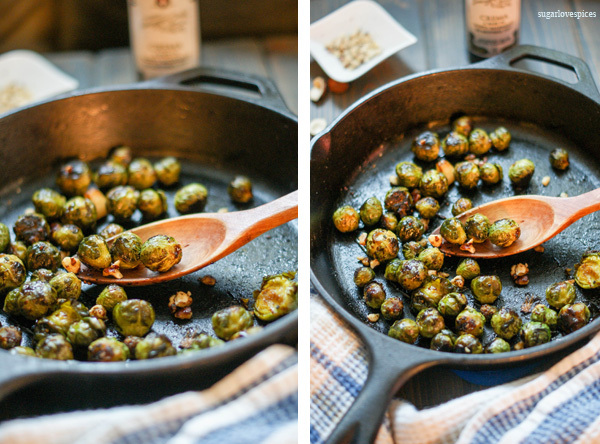 I wasn’t very fond of brussels sprouts either, but now I eat them once in a while, especially if they are roasted to a beautiful caramelization 😉 . I never knew brussel sprouts could sound so exotic. I’m not a huge fan but I made them every once and awhile for my mother-in-law. Oh my…you were there! Thank goodness you were on the bateau mouche! Even in Rome they are on alert. I talk to my family and friends every day and they say it feels so akward to have police in the subway and on the streets, especially downtown, but the yearning to go on with your life and enjoy your city is stronger than ever! Thanks for your words, I really appreciated to share some thoughts. Feel less lonely out there! Mmmm. A holiday classic with a twist…love it! I am going to have to share this with my family this season. Thank you Dylan. I usually try to give a twist to vegetables that I am not super fond of. It helps me enjoy them more 😉 . Thanks so much! I would use a balsamic glaze which I believe has more or less the same thickness and will caramelize gorgeously. Absolutely love your positive attitude through what was the most difficult time for your friends and family. A lovely post and a wonderful recipe. I seem to have always made Brussel Sprouts with chestnuts but this year, will be trying your little twist with the hazelnuts and the balsamic glaze. Thank you! Thank you Ginni, much appreciated. As I said, I’m not a brussels sprouts connoisseur, but cooked that way I could actually enjoy them. I love chestnuts, though, I wonder if I might like your version too. I’d have to try 🙂 . Nicoletta, this is a lovely post and response to the tragic events in Paris and elsewhere. My parents were Belgian, so I feel a connection to events there. And not to be trivial, but also to Brussels sprouts, which my mother made often. I like to call them spruitjes, in the Flemish way. I quite enjoy sprouts, especially roasted. The balsamic cream sounds intriguing! Thanks for your words, Marlene. I’ve always liked, when in Belgium, to see that they used both the english and the flemish language, so spruitjes it is! 🙂 And I loved visiting Ghent, Bruges and Antwerp, so beautiful! 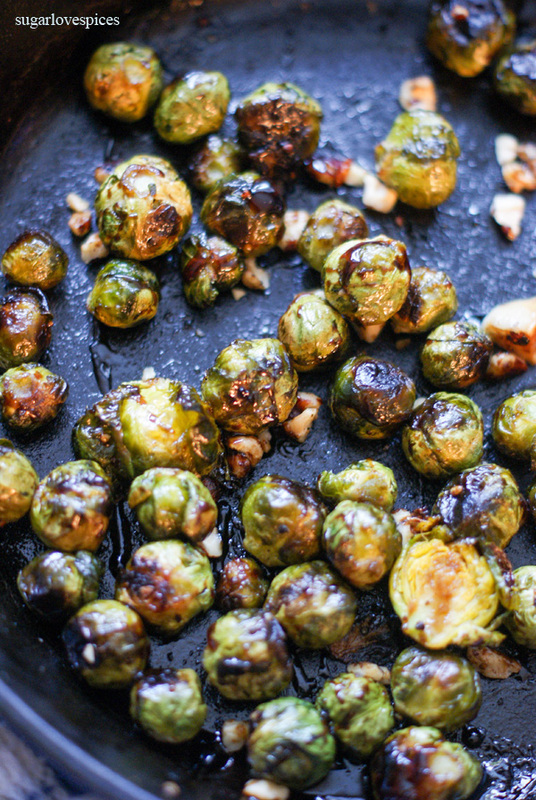 If you enjoy roasted sprouts, give this a try. I know exactly how you feel. My mom’s side of the family lives in the UK and I called London my home for a while after university. I remember when I was 20 and staying with my uncle in Surrey while I was on vacation in England. He and I were going to venture into London so I could cash some old currency I had. That morning, I woke up and my uncle told me we weren’t going. There had been an IRA bombing in the financial district – right where we would have been. This idea of random attacks, people going about their lives and suddenly being hurt or killed and the fear that strikes were so new to me after growing up in Canada. There have been several bombings in London since then and every time, fear runs through me like a knife that I may have lost somebody. I do not understand this ugliness… not when we are all humans and we can all contribute so many beautiful things to this world. I want that same exact world that you do. We are all one people! Thanks Melissa, yes, even London has suffered some ugliness. It would not be that hard to have a world of unity and peace, if we all accepted and respected the diversities. Like you say, we are all one people, after all! I have never heard of balsamic cream. How does it compare to mosto cotto? I love that stuff! 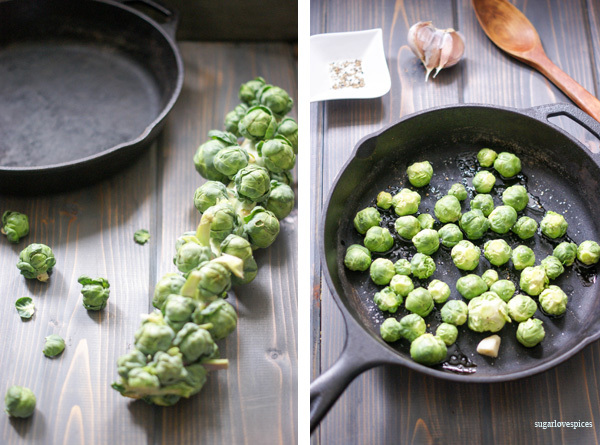 I make something similar with brussels sprouts so I know this would be fabulous. I don’t know mosto cotto, but I would imagine it tastes great and I would definitely add it to my roasted veggies (including brussels sprouts). Let me know if you try it!